Frogs are like little evolutional miracles transforming right under our noses. In their one life-cycle, the whole of evolution is revealed (that is, if you take a Darwinian approach). Whether you dig evolutionism, or you are creationist, there is no denying the frog is a marvel at transformation. In just a short 12 weeks, the frog will move from an exclusively all-water environment to a more liberated existence as a both land & water dweller. The gills it used in its underwater life will be replaced with lungs as an adult. The rudder tail it had to aid in swimming as a little nipper will drop off in adulthood. Some really major and incredible transformations take place in frogdom. 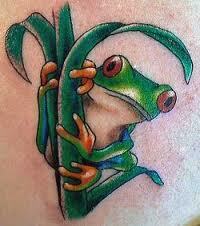 That’s why, so often a frog tattoo is symbolic of immense and profound transitions within the owners life. I’m talking about changes that totally change the inner and outer landscape of a person’s life. The frog is a totem for people who have undergone such overwhelming transition.